My Chocolate Chips Didn’t Sink! Remember when I complained about my chocolate chips sinking to the bottom of the dish whenever I baked? Well, I followed the advice of my friends Anita and Deepthi and dusted the chocolate chips with flour before adding them to the batter. And it worked!! I made a chocolate chip and walnut loaf. The chocolate was warm and gooey out of the oven. I have been posting sporadically because I am away visiting family and attending weddings. I’ll put the recipe up for this one after the long weekend. P.S. Speaking of Easter: I did not make any Easter eggs. In my defense, the above loaf contains eggs. No Easter eggs, but something made with eggs for the Easter weekend! Thanks Sportsglut! Chocolate chips should be made the world’s comfort food. Looks great! Have a great Easter weekend! yay!! 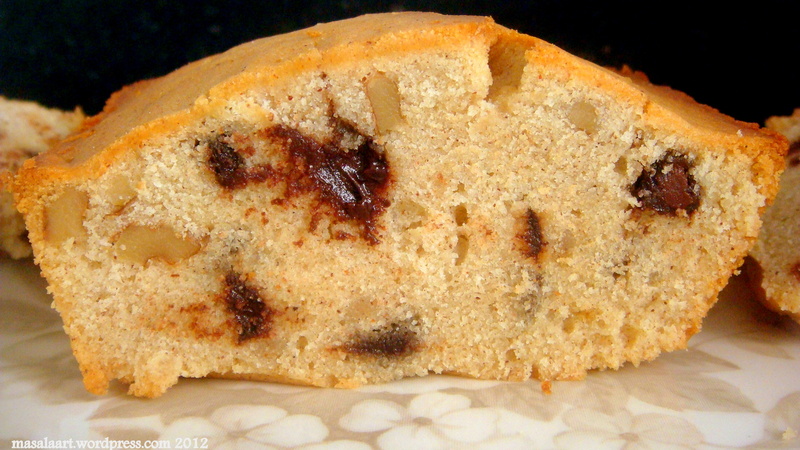 !… the choco chips look so good in the loaf. They make loaves so prettty, na?